One of my very first posts was about avatar size. It's an issue that's been around since the beginning of Second Life. After a discussion with Vir Linden at today's Content Creation group meeting, I've submitted a Jira requesting a new feature for the SL appearance editor. Deformers and attachments can alter an avatar's size in ways the viewer and server cannot account for. SL's own broken existing system for checking an avatar's size is tied to too many other features to be fixed this late in the game. So rather than fixing the inaccurate height currently display, why don't we just get rid of it entirely and use a visual scale. 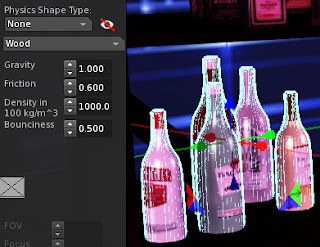 An inworld overlay just like the object editor uses. Put height information right there, next to the avatar. This completely circumvents the issues that make fixing AgentSize impossible, and it works for all avatars, even those who use attachments and deformers to alter their avatar's size. But why even worry about this? It's a visual design issue. 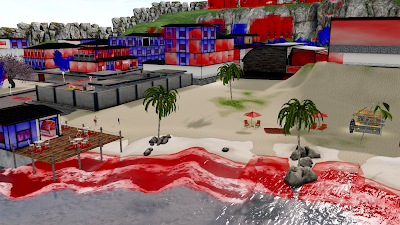 When creating any content in Second Life, from a house to your own avatar, it helps to have this information in front of you otherwise you end up with visual inconsistencies that negatively impact how good Second Life looks and how you interact with your environment. It is also a content creation issue. Nearly all content creators use their own avatar as their sole point of reference for scale when creating content. This is true whether you're talking animations or houses. This can result in houses where the windows are way above the average avatar's heads, or staircases where each step comes up to their knees. Or animations created for specific avatar sizes but incorrectly labeled when sold due to the existing confusion. We see problems like the above every day in Second Life. Fixing this now would lead to generally better consistency for new content going forward. Optimization Tutorial: Creating Your Own LOD Models! Before we begin, this is not a "how to learn Blender" tutorial. 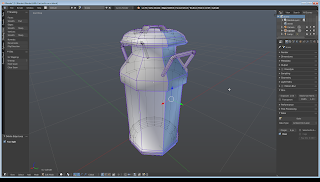 You should already have a basic grasp of Blender to get the most out of this tutorial. If you're looking to learn how to use Blender, there are many of those tutorials online which already cover that topic better than I ever could! If you're a Blender Beginner, or someone who has never even touched Blender before, then I recommend "Blender for Beginners" by Blender Guru. It's a super friendly, super easy to follow tutorial that will have you creating your own mesh content in no time! A lot of SL users are worried that if Linden Lab ever attempted to reign in unoptimized content, it might push content creators away. So beginning today I want to start showing you just how easy optimization is. The first thing we're going to look at is creating your own LOD models using this milk can model I created. "LOD" stands for "Level Of Detail", it's a trick game engines use to reduce the rendering load by swapping out your close up, high detail models, with increasingly lower poly models the further away the object is. Bonus Tip: Smaller items transition to their lower LOD states over shorter distances than larger items, which is why mesh uses less Land Impact when you shrink it! Smaller objects are easier to render! 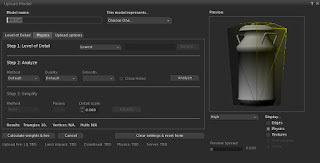 Of course, in Second Life LL provides the option to let the mesh uploader automatically generate LOD models Unfortunately it's not very good at this, leading people to try and use their highest detail model for High, Medium and sometimes even Low detail settings, while sacrificing Low and Lowest to offset the LI increase. 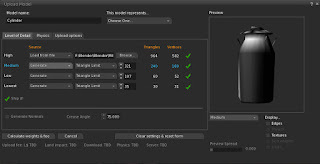 The results are not pretty, worse yet content creators often tell customers to increase their object detail to compensate for the poor LOD of their creations. At Medium detail, the uploader generated model is already falling apart! No Second Life user should ever need to set their Object Detail up higher than 2.5-2.75. When you tell others to increase their object detail to see your work properly, you've done something wrong and you're basically telling them to sacrifice their FPS to cover for it. But this does not mean you're stuck with awful pre-generated LOD models, or forced to increase the Land Impact cost of your content! 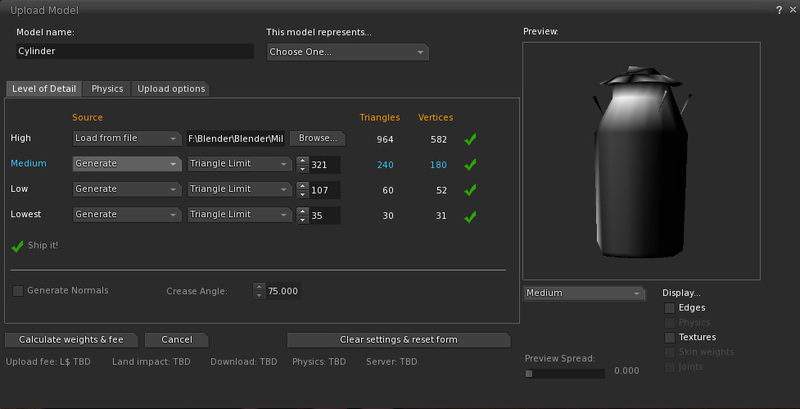 SL also gives you the option to upload your own LOD models! Nearly half the triangles and it still looks great! Done well, no one will even notice the transition between detail levels! 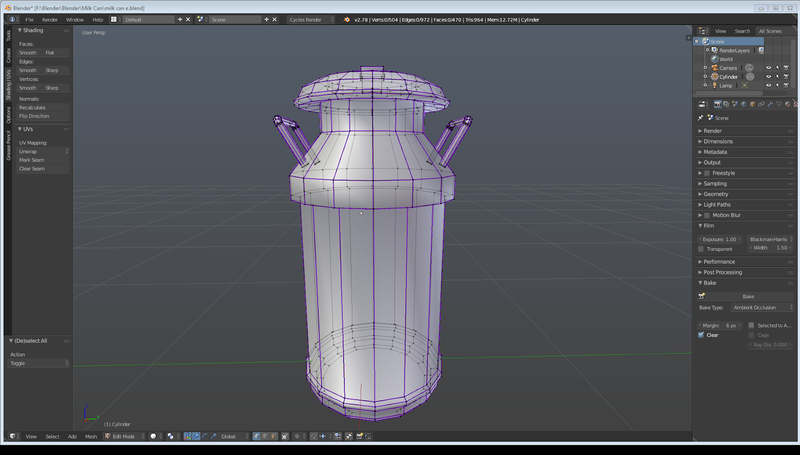 Here's my milk can at every Level of Detail! 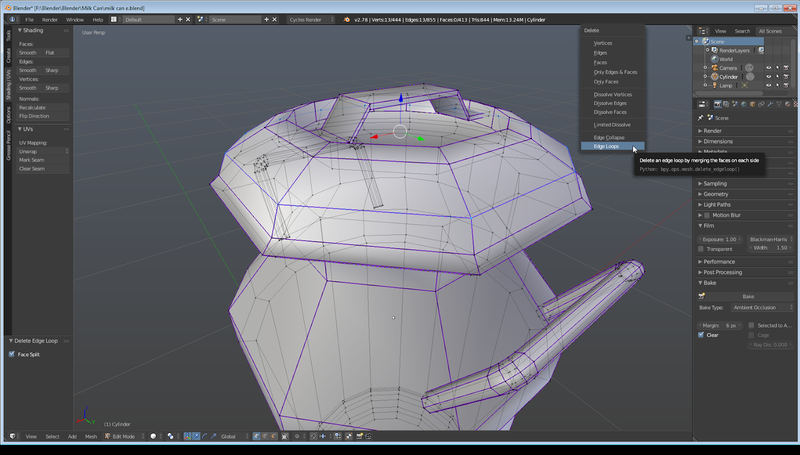 It more or less holds it's shape until the lowest LOD when it becomes a box. And that's fine because at Low and Lowest levels the milk can will be far enough away that you shouldn't notice that it's beginning to lose it's shape. 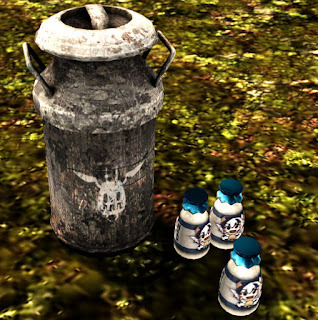 And if you're wondering, the Land Impact cost of the milk can is 0.5, meaning you can link two together and it will still only be 1 LI. How much extra work is it to create your own LOD models over letting the mesh uploader generate them for you? Not nearly as much as you might think. 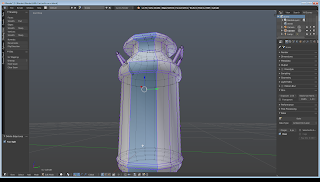 Let's hop over to Blender to see how it's done! 1. I started here, with my full detail model. 2. In Edit mode I make sure no vertices are selected to start. Then, holding down the Alt Button I begin selecting vertices down a line, until Blender selects the full line of vertices I want. 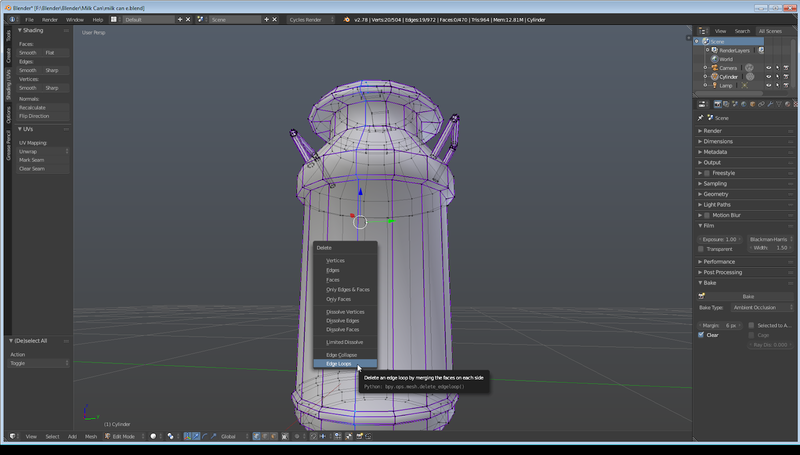 Blender can be finnicky, and it might take several tries before the row you want is selected. Just keep holding Alt and clicking on vertices along the row you want. I decided to start vertically, the blue line shows the vertical row of vertices I've selected. This row of vertices is called an "Edge Loop". 3. Now I press the X Key to bring up this menu shown below. 5. I did this all the way around the model until I'd deleted half of the edge loops. Then I did the same to the two small side handles. This effectively cut the triangle count of the model in half while retaining the overall shape. That gave me my Medium LOD model. As a rule of thumb, you generally want each LOD level to be about half of the one before it. That's not a hard rule, of course. Use your judgement. You can do horizontal Edge Loops, too! 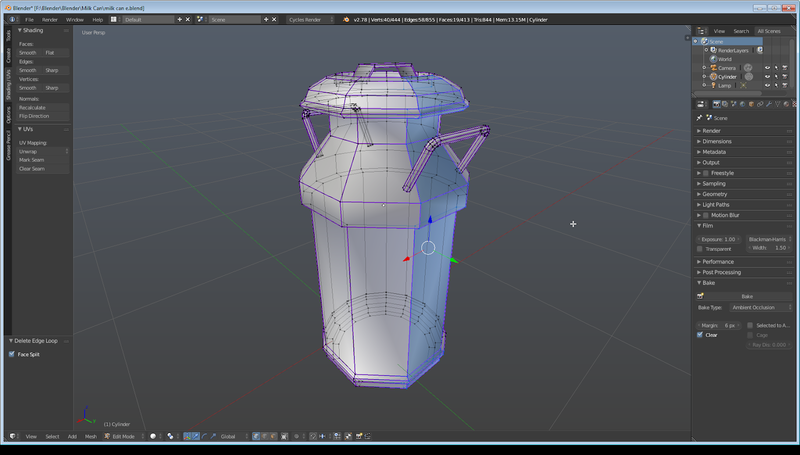 Which is how I reduced the can further for my Low LOD model. Hold Alt, select vertices until the row you want is selected, then hit X to bring up the delete menu. Delete the edge loop to simplify the model. Again, use your judgement! This is what separates you from the automated LOD generator. Where can you remove details that won't be noticeable at that distance? Again, keep in mind that larger objects will retain their higher LOD levels over greater distances. It may even take a little trial and error before you get the hang of it, but once you do then creating your own LOD models won't take long at all! 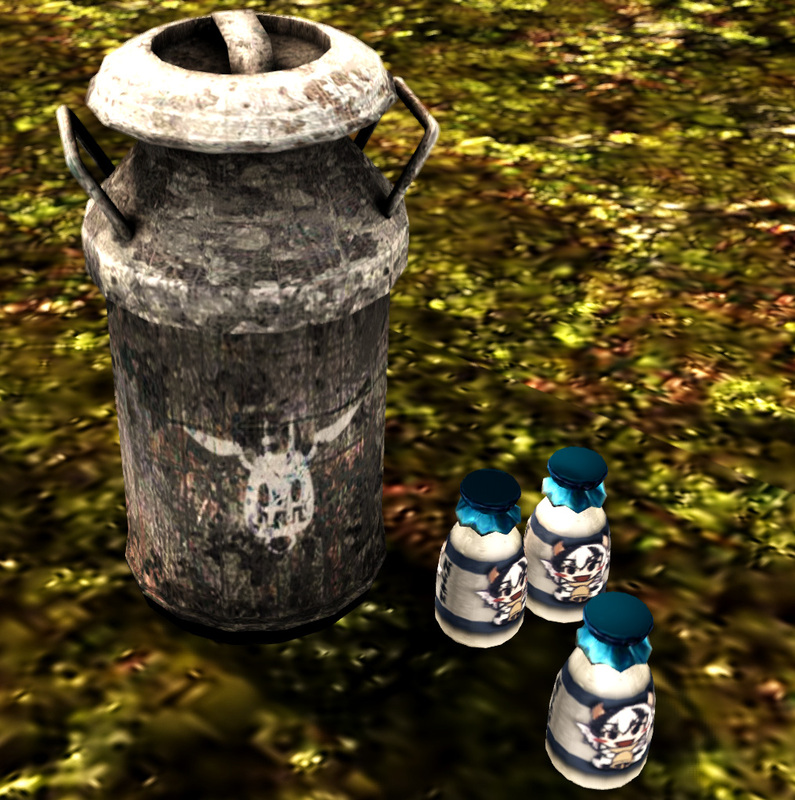 It only took me minutes to create the LOD models for this milk can. As an extra benefit to handling LOD this way, when setting up the physics for your mesh object you can use one of your LOD models as the physics box, which can result in a yet lower Land Impact cost than using Mesh Uploader model generator. And there you go. That is all there is to creating your own LOD models for Second Life. Now get out there and start creating content that doesn't fall apart the moment someone moves a few feet away from it! Or How to Enjoy the Benefits of Building to Scale Without Making it Impossible for Others to Explore Your Creation! A lot of people tell me that they want to scale their builds down, but feel that if they do larger avatars will not be able to fit through doors in their sims. This is a very valid concern, but one with several very simple solutions. Before we get into the solutions, first remember that you can only resize a building that is either modifiable or includes a resize script (most no-mod houses do not, at the time of this writing, include a resize script). So your safest bet is to avoid buying no-mod. If you build mesh houses/buildings yourself I'll say right away that the best solution is to leave the wall over the door phantom. Bam! Done! 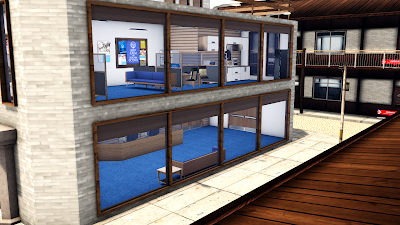 You've made a building that is more accessible to all sorts of SL users and a bit easier to rescale to better suite for your customers purposes. For those of you who have purchased your buildings and need solutions to the small door problem, read on! Here is a mesh house I've shrunk down to about 1=1 scale. For reference, my avatar is 6'1" and the door frame is about a foot and a half or two feet taller. So how is an 8-9' tall avatar going to fit inside that? EASILY! First you need to find out how the physics for your structure are done. Many mesh buildings use a shell of some sort, separate from the mesh model. Not all structures do this. If your building has no separate physics box, a quick solution is to see if the wall over the door is a separate mesh item you can simply set phantom. 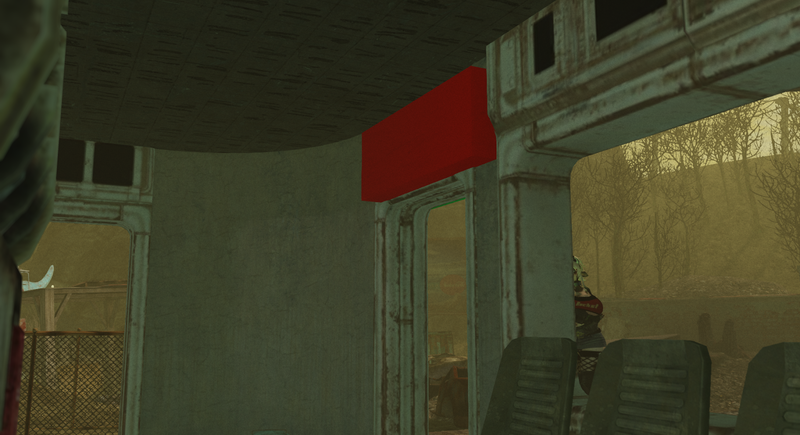 Even if it's connected to the wall on either side of the door you can set it all to phantom and put two invisible prims in its place. If the building is a single structure that can't be separated you may have to set the whole thing phantom and build the physics with prims, I'll explain that a bit more later. 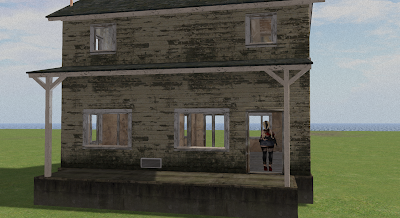 In the meantime, let's reveal the physics prims for this house! The prim physics boxes are blue! Notice how there's no prim covering the wall above the door! That wall is completely phantom so avatars of any size can fit. All of the interior doors for the house are the same! Leave that space blank and you have doors anyone can squeeze through. So what if your structure doesn't use prims for the physics? Set the building phantom and build a physics shell out of prims like I did for this house! If you also set the house itself to "no-physics" you can often reduce it's land impact considerably! 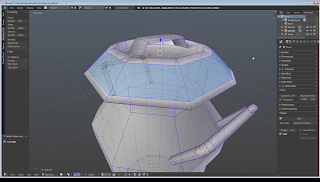 The root object of a linkset must have physics so you may have to link the house to a prim first, set the whole structure to "no-physics" then set the prim itself to "convex hull" for minimum land impact. Remember to set the physics prims to "convex hull" to reduce their own land impact. After you've done all this you can often link the no-physics house to the convex hull prim shell for even more of a land impact reduction. The entire house in this example is 21 land impact. Another solution to the small doors problem is to place a teleporter above the door! 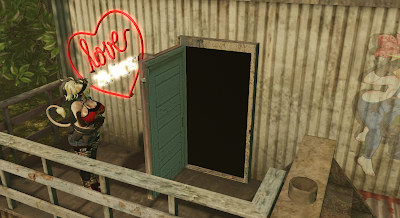 Just rez a prim above the door frame, where the physics for the wall over the door begins, like so. And one for the opposite side of the door as well. Then you simply make the prims invisible and put a teleporter script inside each. If you want this to be completely seamless you'll need an Experience Key. This way when an avatar collides with the prim they will automatically be teleported to the other side of the door frame. They may not even notice the teleport. If you do not have access to an Experience, you can put a script inside the prim which informs the avatar colliding that they need to click above the door to "duck". Setting the prim to "sit when touched" and an old fashioned sit teleporter script will then be enough to achieve the effect. Success! A door anyone can pass through! There is an alternate way to use teleporters to create doors anyone can pass through. That is to make the entire doorway itself a teleporter! 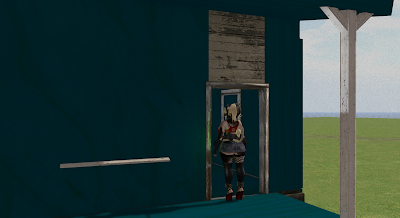 I like to put building interiors into skyboxes (reduces lag, increases framerates, and gives me more freedom in building) and the entrances/exits for these skyboxes are teleporters disguised as doors. You can script your own or use a an existing door teleporter like Curio Obscura's "Anywhere Door". The "Anywhere Door" is a sit teleporter. You click the door to open, then click the open doorway to be teleported to the door's destination. My own sims now use an Experience based teleporter for a more seamless experience. You click on the door to open it and then simply walk into the open doorway to be teleported. And there you have it! Three solutions to the problem of doors being too small for giant sized avatars! I hope these examples help you out in your own sim building adventures, if you have any questions, leave them in the comments below! The topic of land pricing in Second Life is a popular one on the forums and in everyday SL chat. Most people agree that land simply costs too much. First off, hey, we'd all like land in SL to be cheaper! That would be great! Hell, I'd love for it to be free! That'd be awesome! But, in order to keep the lights on, LL has to cover their expenses and, according to statements from LL, land cost is where they get most of their money. Not the marketplace. Not premium accounts. Land ownership. Now, there are arguments to be made for lowering the price of land to get more people buying land. I've made those arguments myself, but that's not what I want to talk about right now. Right now I want to point out that if you own land in SL, chances are you're wasting most of it without even realizing it! That's right, you own more land than you realize! Here's the thing, from prims to mesh to avatars, everything in SL can be made larger or smaller...except land. If you want more land you have to buy more land. You can't go into "Edit Land", grab the little white box in the corner and stretch it all larger like a prim or mesh object. There's no "Land Size" slider you can adjust to make your land larger or smaller like an avatar shape. If you're paying for 512sq.m. of land that is all you get. If you make all of the content on that land larger, you are making your land smaller in relation. Don't believe me? Here's an exercise, rez a cube and make it 10x10m. That's the size of a 33x33 foot room. Don't make any walls yet we're just doing an exercise here. Ok, so there's are 10x10m(33x33') room. For reference, my avatar in this scene is 6'1" in those shoes. So slightly taller than average for an adult man in the real world. Now let's decorate, but we're first going to decorate with furniture at the typical sizes furniture in SL comes at out of the box. Looks comfy, right? Keep in mind most men in SL are 7-9' tall, so significantly larger than my avatar in this picture. That's why I seem so small despite being 6'1". You can find women of all sizes in SL, tall and short, but it's extremely rare to see a guy shorter than 7' in SL, so most furniture in SL is made to accommodate men 7-9' tall. 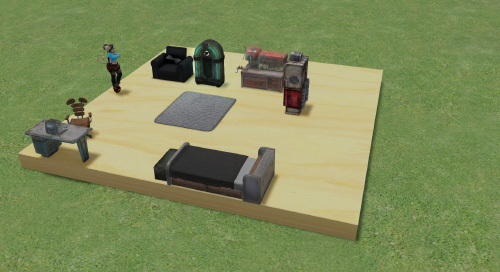 So let's see what happens when we resize the furniture to be 1=1 scale. That is, how large these items should be if we're assuming realistic human sizes for avatars. Wow, my avatar doesn't look tiny anymore, and look at all this extra space! It's as if we suddenly have more land to work with! Almost twice as much space it looks like! I'd recommend avoiding no-mod furniture since you obviously won't be able to scale it down like this if you can't modify it. Now, with smaller items like furniture, you don't typically save much Land Impact by scaling it down, you're mostly saving space. A couple points here and there, but it's not usually a huge savings. But with buildings, on the other hand, if we reduce the typical SL house down to 1=1 scale we're often going to see huge Land Impact saves. I usually manage to cut the LI of a house or other structure down to half when I reduce it closer to 1=1 scale. Buildings also tend to be scaled up much more than furniture. Again, furniture is scaled up to accommodate 7-9' tall avatars, but buildings have to accommodate SL's awful default camera placement so people tend to make buildings, vehicles, etcetera more like double scale. If you make a room much smaller than 10x10m you're going to have a lot of issues with the camera, but we can fix this! Click here for an article about the camera settings I've been using since at least 2007. They solve every camera issue you're going to run into when trying to build smaller. Better still, LL will be adding these settings to the official viewer in an upcoming viewer update, along with tools to change and save your very own personal camera placement settings! So look forward to that! And I'm not even saying we should all be building to 1=1 scale, so please don't misunderstand. Even with my improved camera settings I would not recommend making rooms much smaller than about 10x10 (but be honest, 10x10 is already tiny compared to most rooms in SL buildings) and I'd even suggest making ceilings a little taller than you'd find in real life. The key part of that is "a little", not a lot. By doing all this you should be able to free up about twice as much space and anywhere from 1/3 up to about half your Land Impact. And this is just one trick to getting more value from the land you're paying for. Just one trick that allows you to build more using less land. There's other tricks to, such as using rezzer systems that allow you to save environments as rezzable packages that are only rezzed on your land when you're using them, and using skyboxes connected via teleporter doorways to build vertically instead of horizontally to take advantage of the 4000m of space above your land. I think LL should do more to showcase these tricks to people so that they can see the true value of the land they're paying for and maybe not feel quite so much like SL land is overpriced. I do a LOT of modding. It's safe to say I have modded every modifiable item I've ever purchased in SL, and so I'm going to be posting a series of articles where I showcase some of the items I've modded, how I did it, and what the benefits were! 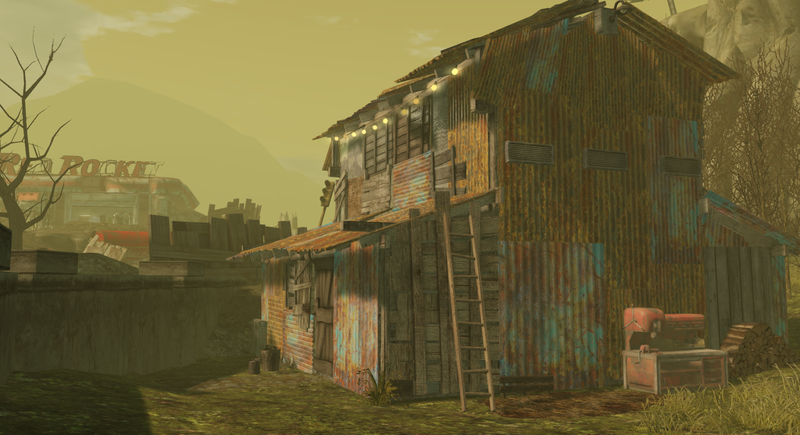 This first article features a wasteland shack in a sim I was commissioned to build. It's the Scrapper's Retreat from CRAnQ. A gorgeous looking piece, but out of the box it has a few problems. Namely, it's 241 LI cost and the fact that it uses about 360MB of VRAM in textures alone. Up front I want to say that none of this should be taken as a negative view of the creator's work. It's a gorgeous looking building and, sadly, these issues are not widely discussed in SL's content creator community so a lot of people simply don't realize they're issues at all. What you should instead take away from this the awesome thing CRAnQ did, selling the building with modify perms! That is what allowed me to take this great wasteland piece they put together and make it even better, and I thank them for giving me that option. In addition, I hope that if they see this article they are able to see what I've done, see how it improves the SL experience, and are able to work these improvements into their future creations! Now, Land Impact cost is easy to understand for anyone who owns or rents land in SL. You only have so much so you want to reduce LI wherever you can so you can fit more content and more detail in your sim. 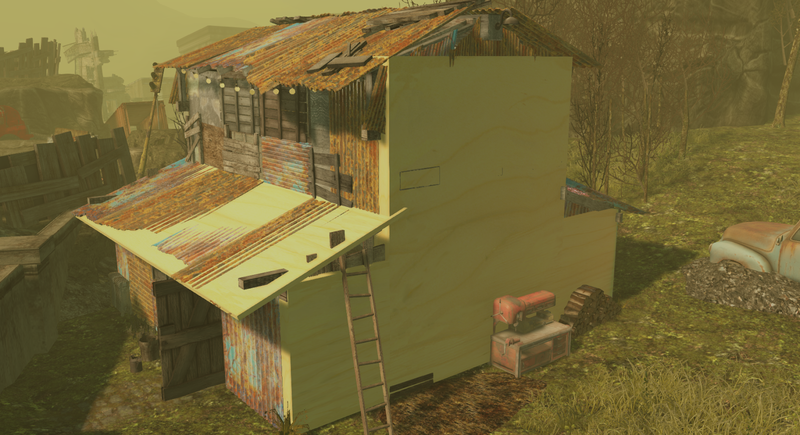 Luckily, this shack is copy/mod so I was able to do exactly that, and easily! First, the shack comes with an array of light sources. They're scripted and add a really great effect but a nearly identical lighting effect can be achieved by replacing the 40 light projectors with 4, and giving the side projectors a light map that mimics multiple sources. (Maybe I'll show how to di this in the future!) I went the simpler route for now and just got rid of the light projectors and did some simple local lighting, but recreating the original light effect is on my to-do list. Second, the lightbulbs strung along the side were each individual objects. Even worse, they're sculpted prims! If you're not aware, each sculpted prim costs 2 land impact points when linked to mesh! I replaced those with a string light mesh I bought off the marketplace. Took seconds to swap them out. Saved a bunch of LI. In addition, the wall mounted lamps on each side of the roof used a prim sphere overtop a mesh lightbulb, possibly because they didn't know how to script fullbright/glow changes to only the lightbulb part of the lamp mesh. I got rid of the prims and just set the mesh bulbs to glow manually. All of this means I lose the scripted lights on/off feature but I don't really need it. Next, I realized that by setting the entire building to "no physics" and replacing the physics with an invisible shell of box prims set to "convex hull" I was able to save yet more land impact. This doesn't always work, but it works often enough to give it a try and here it ended up saving me a tonne of Land Impact points. And finally, the building was way too large so I shrunk it down to proper scale for the sim, reducing the land impact even further. Larger mesh objects cost more LI because they retain their higher LOD levels over greater distances the larger they are. 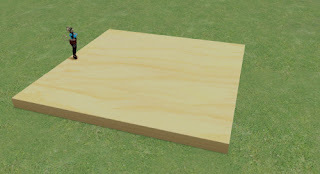 Most content is made around twice the size it should be if everything is to scale with inworld measurements. Shrinking your avatar to human sizes and adjusting your camera so it doesn't need so much more space for you to see properly really helps you save a lot of space and money. If you ever thought land in SL was too expensive, this is the easiest way to cut the cost of land drastically. Doing these simple things I reduced to LI cost of the structure from 241 to 123. About half. Still a lot for a single structure, but given the sheer amount of detail I'm a lot more comfortable with it. VRAM/Texture Memory is less common knowledge in SL but I'll try and summarize. 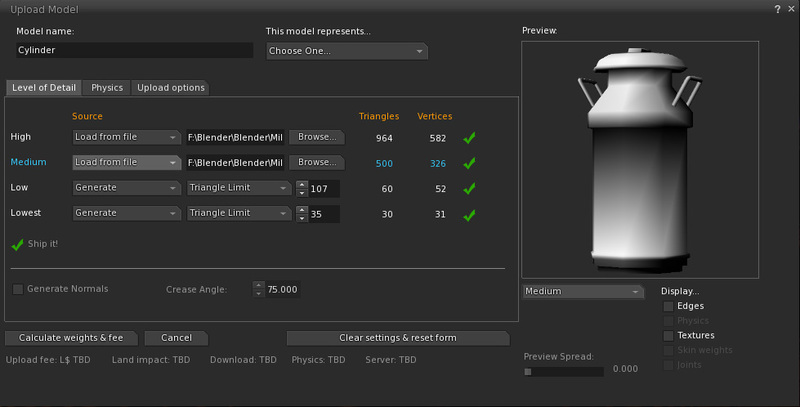 Your graphics card has a set amount of memory to use rendering what you see in SL. All the textures you see have to be in that memory to be displayed, but so much more relies on that memory so you cannot max your card's memory out on textures alone or you see massive framerate losses and "texture thrashing". Texture thrashing is when you see textures going blurry and re-rezzing. You also have to download all these textures, which contributes to lag and slow rez times. 360MB might not sound like a lot of memory, but it's only one building in an entire sim and then you throw avatars and their memory use into the mix. My videocard only has 2GB of VRAM. It's a midrange card, a few years old. Newer, more expensive cards have up to around 8GB. Onboard graphics have very little, if any, dedicated memory. Following so far? Ok, good! This scrap house is covered in various unique corrugated metal panels. They're not identical. Out of the box there's like 6-12 different panels each with it's own texture, spec map and normal map. All of which are 1024x1024. 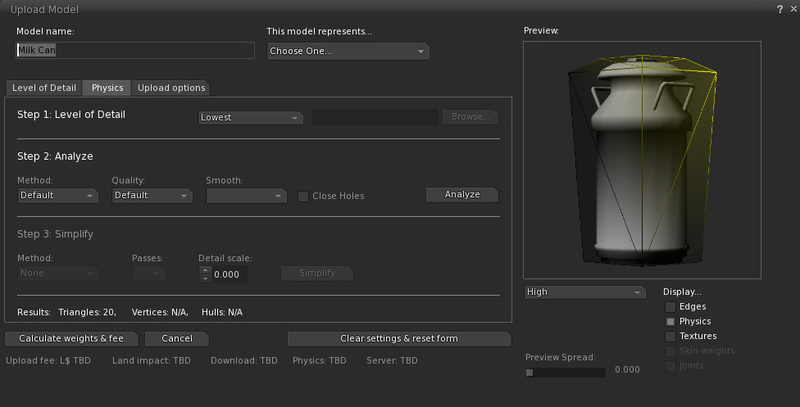 Each texture uses 4MB of memory on its own and it's simple arithmetic to see how that adds up. What I did was remove every type of panel except 2. Then I copied the remaining 2 panels to replace each of the panels I removed. Not difficult, but a little tedious and time consuming. But worth it! I was able to reduce the memory load of the house from 360MB down to 207MB. 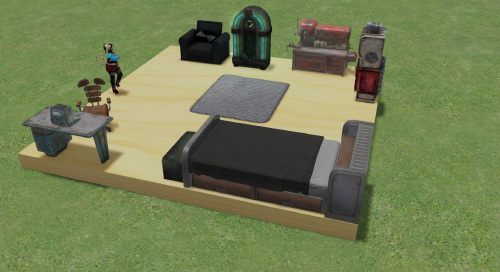 Here's a screenshot from the marketplace listing showing the original texture variety so you can compare. Yes, it's a little more detailed, but that detail comes at a cost in framerates, lag, and texture thrashing. What's more, are people going to notice the difference? Those who saw this building in my sim before and after did not notice the change until I pointed it out to them myself. You might be able to do the same if you notice items in your sim are similar, yet use different textures! Many SL buildings, for example, will have nearly identical textures for walls, floors, etcetera, where the only differences are slight variations in shading or colour that most people will never even notice! You can compare textures in the preview window of the texture chooser tab of the SL editing panel and see if this is the case, then it's a simple matter of unlinking pieces, and copying the one instance to replace the pieces with the redundant textures! In some buildings this is easy, in some buildings all of the walls may be a single mesh object which means you'll have to look for an alternative solution, such as replacing the textures entirely with one of your own. I also noticed that this house used the same stair kit as another building I have in the sim, but different textures. I swapped out the stairs with the identical stairs from the other house to reduce the sim's VRAM load further! And other buildings in the sim also use corrugated metal panels, I replaced them all with one of the two metal panels from this house and probably cut another 100-200MB of memory out of the sim. All of this means visitors to the sim get to experience higher framerates, less lag, little if any texture thrashing and fast rez times! And I hope the rest of you are able to implement these ideas into your own homes, clubs, RP sims, and other environments and improve your own SL experience! I'll be posting more articles like this, showcasing modifiable content that I've purchased and found ways to improve. Until then, take care and keep fighting the good fight!